Boating generates a lot of waste, including garbage, used oil, oil filters, oil absorbents, stale or contaminated gas, paints, varnishes, thinners, solvents, batteries and antifreeze. Not only is trash ugly, but it kills fish and wildlife – any foreign substance entering the water can harm marine life. Plastics break down into smaller pieces and are eaten by marine life, and can fouls props or engine intakes and cause expensive repairs. The Vancouver Aquarium estimates that at any given moment, there are 400 sea lions entangled in marine debris. In BC 22,462 volunteers collected 5,550 bags (42,279 kg) of garbage in the 2014 Great Canadian Shoreline Cleanup. As boaters, it is our responsibility to prevent our waste from harming wildlife and fouling the marine environment and our shorelines. Garbage facilities are not available in many remote areas, so plan to bring everything you take back with you. Reduce waste before you leave the dock. Remove labels, only bring what you need, and store items in containers that you can later use for compost or waste storage. Don’t let trash get thrown, blown or washed overboard. Half a million boaters ply BC waters, so avoid disposing of even seemingly harmless waste into the water. Do not mix used oil, fuel, paints, or other products. Find lots of useful tips and resources on waste disposal, waste reduction, alternatives to toxic products, and more in our handy Guide to Green Boating. Used oil, filters and absorbents, as well as antifreeze may be taken by your marina or service station. If not, you can find a collection facility with the BC Used Oil Management Association. Batteries can be returned to battery retailers or your local recycling depot. 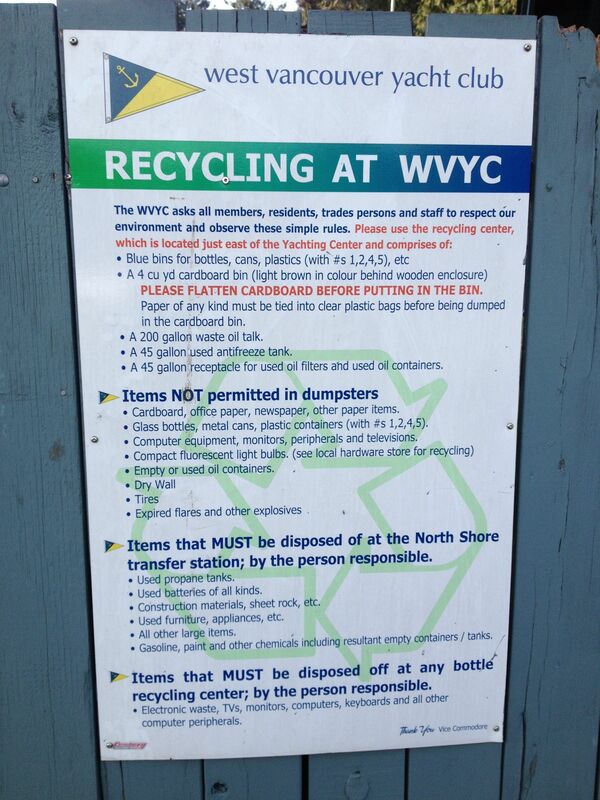 If you are unsure how or where to properly dispose of an item, the Recycling Council of BC website can help. 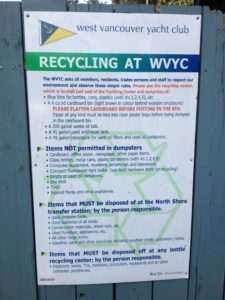 You can also call their recycling hotline at 1.604.RECYCLE in the Lower Mainland, 1.800.667.4321 for the rest of BC, or email them at hotline@rcbc.ca. There’s even a BC Recylepedia Smart Phone App. ReGeneration provides special waste recycling programs for paints, pesticides and flammable liquids, lighting products, appliances, power tools and equipment and more. The electronics industry, through the Electronic Products Recycling Association of BC, is committed to providing British Columbians with efficient, convenient and environmentally sound solutions for managing end-of-life electronics. Boating U.S. Foundation has great resources and information on waste management and recycling. The Ocean Conservancy is fighting for trash free seas.